For as far as written history permits us to remember, mankind has always witnessed strange things happen in the skies, which people, by the standards of that particular time, have not been able to explain adequately. The sighting of an unidentified flying object or UFO is not a rare phenomenon, and many of these occurrences over the years have been carefully studied and subsequently debunked, while others remain as mysteries that baffle even the best of us. 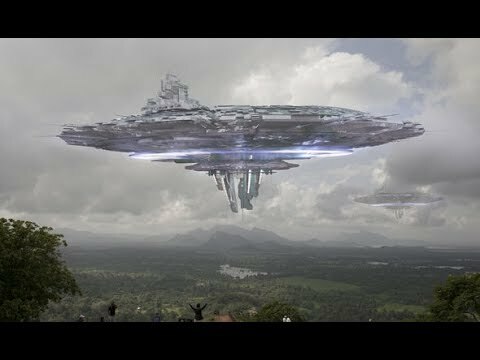 Among those which are left unexplained, many of these UFO sightings are believed to be flying spaceships of extraterrestrial beings. However, not all unidentified flying objects are potential alien spacecraft. Some are even stranger. One such remarkable and unexplained phenomenon took place in a small village in Sweden over 200 years ago. On May 16, 1808, civilians living in the small village of Biskopsberga – which is located near Skanninge in Ostergotland, Sweden – witnessed a strange event which cannot be easily explained. At present, the village no longer exists, but at the time of the unusual phenomenon, it was the home of around 300 inhabitants. The UFO sighting took place in a hot and cloudless afternoon. The wind was blowing from the west. People were still preoccupied with working on their farms when they noticed that the sun shining over their village suddenly dimmed, turning into a dull brick-red shade. The sunlight became so dark that villagers could stare right into the sun without feeling any kind of pain in their eyes. At the same time that darkness engulfed the small village, a large number of spherical objects appeared from the western horizon. These unidentified objects appeared small, and they measured just several inches in diameter. They appeared dark brown in color and they seemed to be headed toward the sun. Then, as these strange figures got closer to the sun, they changed their colors from dark brown to black. For some unknown reason, the spherical objects changed their course slightly, moving in a straight procession across the sky to the eastern horizon. When these small figures approached the sun, they reduced their speed, only to increase their pace again after passing in front of it. The strange phenomenon didn’t stop there. For a significant period of time, new spheres appeared from the west and subsequently disappeared when they reached the east. That afternoon, the number of spheres flying across the village’s sky was so many that it became impossible to count them. In the eyes of the villagers, it seemed as if millions of small balls were, for reasons unknown to them, suddenly flying in the heavens. According to the Transactions of the Swedish Academy of Sciences from 1808, “the phenomenon lasted uninterruptedly, upwards of two hours, during which time millions of similar bodies continually rose in the west, one after the other irregularly, and continued their career in exactly the same manner.” One of the witnesses of this unusual phenomenon in the skies over Biskopsberga was K.G. Wettermark, who was a respectable citizen and secretary of the Swedish Academy of Sciences. Not far from where Wettermark stood, one of the spheres fell down to the ground, and he managed to observe the ball’s behavior when it did. He noticed that just before these spheres touched the ground, they looked like air-bubbles which children used to play with and produce from soapsuds using a reed. Moreover, he immediately examined a spot where one of the balls had fallen, and he saw nothing but a scarcely perceptible gelatinous film which was as thin and fine as a cobweb. It was still changing colors, but it soon dried up entirely and vanished without a trace. What were these weird bubbles? Why were there so many of them flying in the skies that afternoon? And why did it seem like they were capable of consciously changing the course of their movement? The older the UFO sighting, the harder it is to investigate and explain. Most likely, the alleged UFO sighting in the skies of Biskopsberga, Sweden in 1808 was nothing more than a natural phenomenon that could not be explained by the scientific knowledge available at the time. And even if modern science is capable of resolving this mystery, a strange case like this one can be very difficult to study as such phenomena occur so rarely. A similar, although not entirely identical incident occurred in Basel, Switzerland on August 7, 1566. At the time, citizens of the city saw a large number of black spheres fill the skies. Not only did these objects appear to be flying towards the sun, they also looked like they were engaged in some sort of aerial battle. The UFO sighting in Switzerland in 1566 took place at the time when the sun rose. People saw many large black balls that moved at great speed in the skies, flying toward the sun. These figures also made half-turns, with each one banging against the others as if they were engaged in fierce combat. Many of them turned red and igneous before they were consumed and died out. The strange phenomenon lasted for several hours that day before disappearing completely. The main difference between the sighting in Sweden in the 19th century and the odd occurrence in Switzerland in the 16th century is that the black spheres in Switzerland were unable to survive the heat from the sun. The spherical objects seen in Sweden, on the other hand, changed direction when they approached the sun. Without a doubt, the inhabitants of Biskopsberga were confused and puzzled by what they had seen happen in their skies. The Swedes didn’t succeed in solving the mystery, and not a single person got closer to the truth even after the UFO sighting in the village that day was published in the North American Review in 1816. At present, there are several theories that have been presented, speculating on what the strange UFO phenomenon in Sweden in 1808 really was. However, just as when the eerie occurrence took place around 200 years ago, no one really knows the answer for sure until now. And so, it is safe to say that this particular case of UFO sighting remains unsolved. .